Chances are you've never been to Muhu, but if you had visited this bitty Estonian island, you'd have discovered a rich knitting tradition bursting with wild colors. 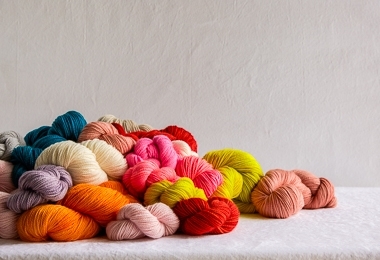 Muhuroosa, aka “Muhu pink,” is the riotous pink that plays center role in Muhu's palette of fiery colors. And for us, it’s the fun and the inspiration of our Muhuroosa Blanket! 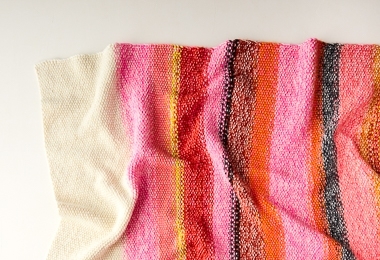 You knit this simple pattern in seed stitch, holding two strands at once and spending four rows to artfully shift between colors for a washy watercolor effect. We used a riotous palette of our Posy and Pocket Posy yarns, an incredibly soft blend of 75% superwash merino, 15% cashmere, and 10% nylon. Both are lovingly hand dyed, adding depth and spontaneity to this color story. Get all the yarn you need to cast on with this Muhuroosa Blanket Bundle... Then, step aside neutrals, it’s muhuroosa time! Click Product Details, above, for more information. Addi Turbo Rockets are the ultimate circular needles for speedy, snag-free knitting! Click here to see our full range of sizes and lengths, or click Add To Basket to purchase these US 7, 32-inch needles for knitting up your very own Muhuroosa Blanket!